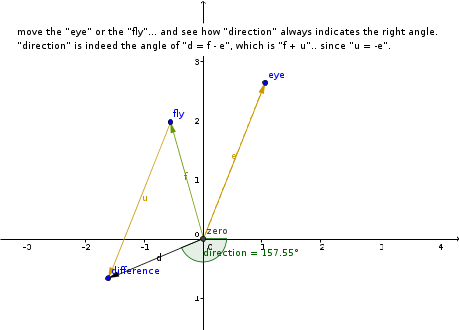 3 First Method, "all by hand"
4 Second Method, "vector angle"
First lets create the fly. In this case I've drawn three Region Layers emulating the two wings and the body. Once created with the Spline Tool, Group them into a Group Layer. It is very important that the fly has to be centered on the Group Layer's Origin. Once grouped the fly layers, the created Group Layer's Origin is at (0,0) so you have to move the fly layers Splines to be around the Group Layer Origin. To do that select all the fly layers, select all the Handles and move them to where the Group Layer Origin is (normally at (0,0)). Once done you can select only the Group Layer and move it around by dragging its Origin's Handle. Now create the Eye. To create it simply create three Circle Layers: One black in the background (contour of the eyeball), one white in the middle (white eyeball) slightly smaller than the black one, and one smaller black for the pupil. Once created place them in that order and below the fly Group Layer. Rename them properly. Add a Solid Color Layer for the background and move it down to the bottom. First Method, "all by hand"
First go to the Group Layer that holds the fly and select the Origin. Right click it and select Export and give the name of 'fly'. Then go to the 'white' layer and the 'black' layer and select both at the same time. You can do this holding Ctrl meanwhile you click on the layers. Once selected both, the Parameters on the Parameters Panel are slightly different. The common parameters are shown (in this case all them because the layers are the same type) but the parameters that have different values are greyed indicating that. Do right click to the Origin and select Link. That would allow to move the origin of both circles as one. Now select the 'white' layer. Repeat the right click on the Origin and you'll obtain other contextual menu. Select Radius parameter and do right click and select Export and name it as 'white radius'. Go to the 'pupil' layer and select the Radius parameter of the circle. Right click and select Export. Give the name of 'pupil radius'. It will be used later. To make the pupil look at the fly where ever it be, we need to automatically move the pupil based on the fly movement and position. To do that we need to make some geometric work. First let's convert the pupil's Origin to Add convert type. To do that select the 'pupil' layer and at the Parameters Panel select the Origin and do right click. At the contextual menu select Convert and in the sub menu select 'Add'. This will add three sub parameters to the Origin. LHS is for 'Left Hand Side' and RHS is for 'Right Hand Side'. In a addition the order of the elements is not important but for a subtraction it is important. You can see those sub parameters by clicking on the triangle that appear near the Origin on the left. 1) The pupil should not go outside the white eye's radius. 2) The pupil should point to the fly in all moment. It will point to the fly if the direction of the vector from the eye's origin to the pupil's origin has the same direction than the vector that goes from the eyes' origin to the fly's position. What does Range do? Range limits the value returned by Link and clamps the value to be between Max and Min. So let's leave the Min sub parameter as its default value (0.0). Now we need to handle the Link and Max values. The Max value should be defined by the pupil and the white circle. I don't like that the pupil bits the black contour so the pupil's origin must be limited by its radius and the white circle radius. If the pupil's radius is smaller, the pupil's origin can be closer to the white circle's radius. To do that we will convert the Max sub parameter to a Subtraction. First let's connect the LHS sub parameter to the white's radius. Go to the Library Panel and select 'white radius' previously exported. Then select the LHS sub parameter from the Max sub parameter and right click on it selecting Connect. Repeat same procedure with the 'pupil radius' exported parameter and the RHS sub parameter. It should look like in the previous image. Now let's handle the Link sub parameter of the Radius sub parameter converted to Range type. The Link represents the radius that we want to limit with the range conversion. It should be the distance between the fly and the eye's origin. If the fly is inside the eye, we don't want to limit the distance, right? that's when range wouldn't modify the Link value. Let's go with it. To be reused later, Export the Vector sub parameter and call it 'vector' as shown in the image. 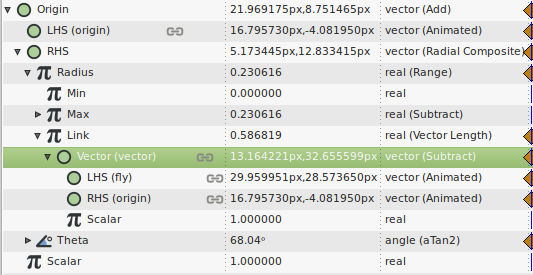 Now Connect each 'X' and 'Y' sub parameters to the recently exported 'vector' value node, that is the vector from the eye's origin to the fly's origin. We are done! Now you can freely animate the eye's origin and the fly's origin and the pupil will always look to the fly. We have achieved the desired effect! Here is the sample file result. Sample file. Export the eye Group Origin as "eye.location", and fly group origin as "fly.location"
Add a Rotate Layer to your eye group, centered on the eye origin. Convert it's "Amount" (angle) to Vector Angle and then convert this vector to Subtract. Link the subtraction "LHS" to "fly.location" and "RHS" to "eye.location". You can now freely move both the eye and the fly... and keep a close watch on the pest. Math are great, we have achieved the desired effect quicker ! ... isn't it ? This page was last modified on 9 September 2014, at 07:24.